Heavy dark clouds were moving above us with light drizzling rain. It was morning 8 AM in Athagarh and there was feeble light around us. We headed to meet Sasmita. Sasmita lives in a small concrete house. When we visited her in the morning she was doing her household chores of cleaning home. Greeted us with a smile. A polite face. She showed us the brightly lit home and said to us, “We use solar extensively.” Also, the power cuts are very frequent in these parts of Orissa. Sasmita’s husband has a grocery shop. She also helps her husband in running the shop. She says, “I have to travel all through the grasslands to reach our shop. I was really scared to cross the fields at night. Now I use solar torch light. It is very bright and I feel safe.” The main solar lamp she used it at home so that her school going son would not face any much problem to study. He studies really well and she expects this loan amount to be an investment she is making for her son’s bright future. 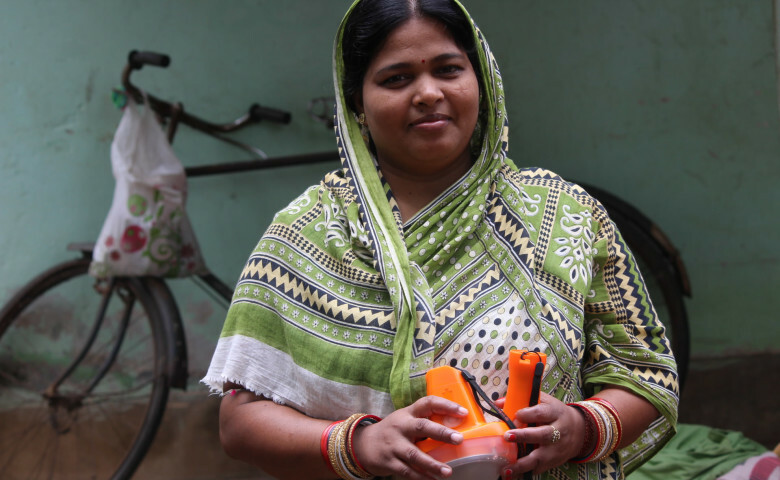 The solar torch helps her to commute to very remote areas without much problem. With the left out amount, she invested in her grocery store business. She has increased her item stocks and has made her shop as a one-stop solution for all major grocery requirements in her area. For the past three months, her income has seen a great increase. With the increased income, she repays her solar loan amount. She does not have to worry about the power cuts and local commute during the night anymore.